Mumbai: The shock wave from the collapse of Bear Stearns Cos. Inc. and Lehman Brothers Holdings Inc. is hitting Tuklal Murmu, an illiterate farmer living in a mud hut in India. “The uncertainty is killing me," said Murmu, who received Rs1.5 lakh in cash as part payment for the land, some of which he said he needs to repair his home. “I have to feed my family of six for at least three years." JSW’s offer had been seen as a model of cooperation with farmers, side-stepping the protests organized by opposition parties that derailed projects by companies, including car maker Tata Motors Ltd and South Korea’s biggest steel maker Posco. 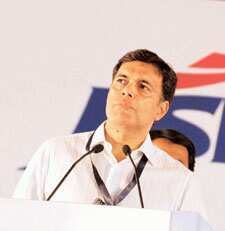 By buying land directly from farmers, without the government as an intermediary, JSW’s managing director Sajjan Jindal avoided confrontation with the opposing politicians. “Jindal was lucky to get a continuous stretch of land and willing farmers," said A.S. Firoz, an independent steel analyst and former chief economist at India’s steel ministry. “We’ve seen several instances where there have been bureaucratic delays and political negativism." Tata Motors was forced to ditch its brand-new factory to build the world’s cheapest car at Singur, about 240km from the JSW project, after farmers demanded the return of land bought at below-market rates by the state government to lease to the auto maker. “We are not against industrialization, but we won’t let the government subsidize companies at the cost of the poor," said Partha Chatterjee, a member of the local opposition party Trinamool Congress that led the rally against the Tata Motors deal. “The villagers don’t know what shares are, so it’s up to us to guide them. We’ll oppose JSW if at any point we think the poor are not being given their due." Chatterjee said his party will ask JSW for a timeline on the company’s plan to give jobs and shares. “The global economy is going through a downturn but we are committed to the West Bengal steel plant," JSW’s Jindal said in an interview. “We will definitely give them the promised jobs and shares. It’s just that the timetable has been pushed back." Construction of the plant, where Murmu has been promised a job, has been delayed by a year and will be completed in 2012. JSW, which planned to build as much as 6 million tonnes of capacity in 4,500 acres, has now cut the size of the project in half, and plans to spend $822 million. The steel maker paid Rs3 lakh per acre to about 1,000 families in the area about 190km from state capital Kolkata. Land issues have also dogged projects in West Bengal’s neighbouring states. Factories planned by ArcelorMittal, the world’s biggest steel maker, and Posco in Jharkhand and Orissa are stuck in feuds with local tribes, who must relocate before construction can start. The issue has sparked bombings and kidnap threats. Maoist rebels detonated landmines at JSW’s groundbreaking ceremony on 2 November, damaging part of the convoy bringing West Bengal chief minister Buddhadeb Bhattacharya to the site. Later, the rebels threatened to kidnap Jindal and his family members, according to a report published in The Times of India newspaper. Posco officials were kidnapped in two separate incidents in May and October by rebels who demanded the $12 billion venture be shifted from the present site in Orissa. Declining prices of steel and rising costs of iron ore, the key raw material, have forced steel makers to scale back production. Prices for hot-rolled steel coil, an industry benchmark, have dropped 13% from a record two months ago. “It’s a double whammy," said Bharath S., an analyst at Sundaram BNP Paribas Mutual Fund. “Prices have slumped, while costs have remained high." Luxembourg-based ArcelorMittal said earlier this month it will reduce production by as much as 35% in the US and 30% in Europe after prices tumbled. Tata Motors ended up moving its factory to Gujarat where the Tata Nano will now roll off the production line in the quarter ending 31 March, instead of the current quarter, the company said. “We learnt from the Tata Motors saga never to count our chickens till they hatched," said Singur villager Sashinath Chaudhry, whose widowed sister-in-law sold her land for the Tata Motors factory. “We had dreamed of a factory and a better life. One day, everything just vanished."